Your computer updates and deletes all of your bookmarks on Explorer, so months’ worth of research is lost. You are frequently irritated by grammar and vocabulary errors, even on Facebook and Twitter. You’re supposed to be making a career out of writing, but you delete more than you write on any given day. These are just a few of the things you’ll find under the “writer problems” hashtag. But if you ask me, the biggest “writer problem” isn’t something that happens to the writer. The problem is the fact that their families are forced to live in a constant state of paranoia. Anything they say can and may be used against them in a future novel. If they’re lucky, it was something funny or debonair that will be quoted by the hero. If they’re not so lucky, words they used during an argument will be uttered by the snarky jerk of a protagonist. Their spouses hear voices. They develop multiple personalities as they walk around talking to themselves in strange accents as they “write” dialog. And the poor things never know if their author partners are just letting their creative juices flow or if their just one step away from a DID or schizophrenia evaluation. The author’s search history can be downright disturbing. My poor husband borrowed my computer to google something one day and when he pulled up my browser, he was met with one disturbing book mark after another. • Can I drink beer with one kidney? The poor guy didn’t know if I might have cancer or I was pregnant. And the bigger question… If I was pregnant, who on earth was the father, since I had apparently already diagnosed him with Erectile Dysfunction. Writing is hard work, to be sure. It takes hours and hours of research. You have to live and relive every scene you write just to make sure you get it right. 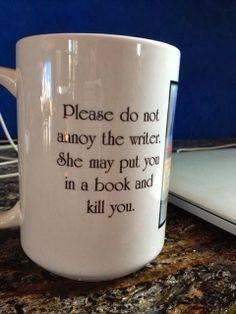 Once you’ve written it, you worry if your brilliance is actually total crap. But at this point, I think I’m glad I’m the writer. At least I know what’s going on in this wicked head of mine. I know why I spontaneously break out in a fit of laughter or burst into tears while staring at my computer screen. Men and women have always had a hard enough time understanding each other to begin with, but my poor husband doesn’t stand a chance. Image from The Writer’s Circle on Facebook.